"The definitive Australian Rules game has finally arrived... thank god!" 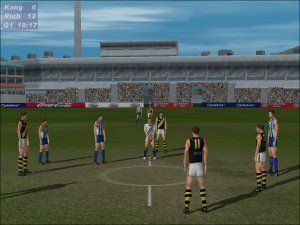 impulsegamer was fortunate enough recently to receive an advance FULL version of AFL Live 2003 on XBox prior to it's release pending on 31st October 2002. 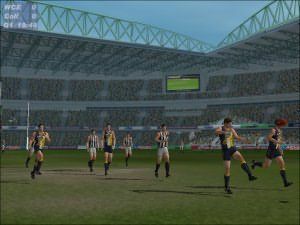 Immediately when you start AFL Live 2003 on the XBox and it boots up you know that you are in for something extremely special. Despite the glut of sports games on the market, there are two things that set this title apart from every other game on the XBox Games Console. Firstly, it is the first AFL game to grace the machine, and secondly, I am delighted to report... this game is practically perfect. Okay, now that I have gotten that out of the way, we can continue with the review. Let's start from the beginning shall we? The game commences with an CGI intro that will get your blood pumping and itching to play this title. It's at this point that the average punter will know that the money they just shelled out was well worth it. The intro tune is by Millencolin and sounds absolutely sensational and should bring some well deserved attention to this cool band. For those of you liking the track, it's called Man or Mouse and is the first song on their album Home From Home. The menu interface itself is sensational and seems to be very similar to the one on the XBox itself in the way it zooms in and out from one menu to the next. 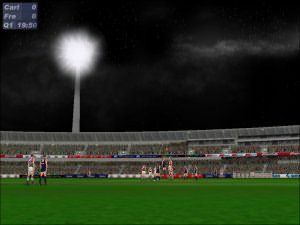 Everything is configurable and the game is designed to give you the best Australian Rules football game you have played up until this point. Getting into a match is extremely easy even if you want to tweak the gameplay a little bit. There are so many things to choose from when starting a game that its almost as much fun exploring the interface as it is playing the actual title! The title has been meticulously planned from start to finish with close consultation with revered and reviled Essendon coach Kevin Sheedy providing insights and tactics available for player selection. Depending on the strategy selected, the gameplay takes on a whole new dimension as the players not directly under your control respond to the general team direction. All players from the 2002 playing lists are available to play and you can recreate the games of the season through a fantastic official 2002 round by round fixture. Players have been modelled based on true stats from the clubs themselves and unlike many other games where the characters are generic, these footballers share the same heights and other details that much each and every single player unique. In normal single player mode after selecting your team, the venue, length of quarters and weather conditions your game will commence and the loading time is extremely quick considering the sheer amount of info that is being loaded up. Once the game is about to start, most gamers will be stoked to see that team banners are in place for your team to charge through onto the field. Yet another extremely cool feature is that due to the sheer number of cameras present in the game, it is rare to see the same entry of the team onto the field at any time. Multiple banners are available to keep it all fresh. Commentary is handled by Channel 10 Football anchor Stephen Quartermain and ex player Gary Lyon. Banter is kept to a minimum and is mainly featured at the start of a match or quarter. Commentary is specific to the current statistics of the game you are in and not just blas� throwaway comments. I did find that the insertion of teams and players did pause just a little which took a bit away from it. Commentary is a bit stilted and is possibly the weakest link in an amazing locally produced game. Other sounds in the game are absolutely brilliant. Stadiums are meticulously recreated and there are six of them to contend in spanning five states. Whilst playing the MCG (sorry, Melbourne Ground) and Docklands, the skyline of Melbourne is clearly visible and recognisable looming over the top of the grandstands. 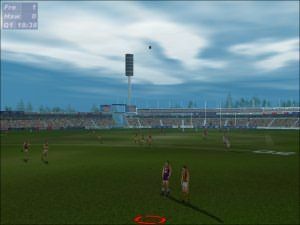 It's these touches, which are basically unnecessary and do not affect gameplay in the slightest that totally immerse you in the title, bringing a sense of realism to every slap of boot against Sherrin leather. 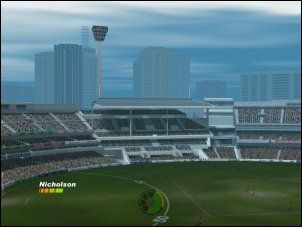 For those people who like finding extras in games, you have been catered for with the inclusion of fantasy stadiums such as a game in outer space and also a game on a suburban oval with cars parked around the field! The XBox handles a staggering amount of graphical information during the game with the faithful creation of more than 40 characters on the field, including both teams and all the umpires. Even the crowd which is normally the extremely lame part of any sport game has been excellently animated. Instead of all jumping up and down foolishly all the time, the team has programmed the crowd to react at different intervals. During the course of the game the playing surface itself takes real time damage and lines painted on the ground slowly wear away. This is not noticeable in most areas other than the centre of the field. The elements are the third opponent in this title, affecting the skills of your players and also the travel of the ball in the air. If a good wind is up, the ball will actually drift slightly in mid flight, resulting in a point rather than the goal you were sure was yours. If the ground takes on too much rain, we also noticed players sliding somewhat and the umpire will throw the ball in the air rather than bounce it in the field. Sydney Swans players Nick Daffy and Paul Williams were used for kicking, marking, handballing, running and other motion captured movements and have been faithfully recreated as is evident from the fluid movements of your players on the field. Every player when selected will show their stats and if they are injured. When marking the ball, an indicator shows where it is safe to kick the ball to which covers the fact that sometimes you cannot see all over the field depending on the camera angle you have chosen. I found the default camera settings to be the most appropriate, however do take the time to play with them, as there are multiple views, even extending to the view from a blimp overlooking the oval! Other movements that players undertake include soccer kicks, tap ons, diving marks, punts and the like. The HUD (heads up display) that appears around the feet of your players is cleverly designed and totally informative without being intrusive. If your player gets too injured, they will show injury and hobble about the field and get in the way. Best take advantage of the interchange bench and give someone else a run. In season mode a severely injured player will miss a match or two but not so long that your stars are out of the game for too long. Players can play on when in possession of the ball with a neat little kick to themselves or a quick bounce. By pressing the Y button will initiate a sprint which is indicated by an energy bar that is off to the left of the screen with your player's name. The R trigger when pressed will perform the ever important bounce that will prevent you from holding the ball. The A button performs a handball and the X will tackle them to the ground. Every button press is easy to achieve and I would estimate that the learning curve for beginners to get into the game fully will be about 30 minutes. 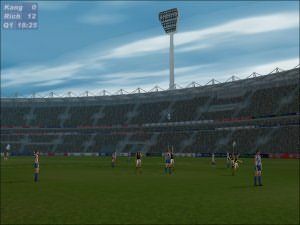 In keeping with being faithful to the game, AFL Live 2003 also features every teams home and away jerseys as applicable. Crowds fly the flags of their teams and in yet another touch of brilliance, it is noticeable to discern followers of each teams as you near each goal post. Chants and crowd sounds have been faithfully reproduced and sound fantastic, adding to the sense of excitement when playing. If you like your football aggressive, then AFL can supply you with that as well with a fully controllable tackling system. Everything from just a slight hip and shoulder to a fully fledged tackle can be achieved and it is kind of cool to see the player you just dropped immediately show an injury if the attack is heavy enough. Marking is handled by enabling anything from a chest mark to a towering 'speccy' that will leave you gasping as your player crashes to earth. The AI of the game is customisable (difficulty levels) and the umpire's are judicious and swift, awarding a further 50 metres if you thwart the free kick. Even the very tricky to judge "holding the ball" is included if you are slow to dispatch a ball after the tackle or if your opponent manages to crush the ball against your chest. Other visits into the field in order to drag you further into the game involved recording the sounds from an Essendon training session and have been recorded with an awesome clarity. The sounds of the tackling will have you shuddering as your rumble feature goes off when hit. Sirens blast and blare and even the umpires calls can be heard calling play on or holding the ball. Multiplayer is also present on the title in abundance, featuring support for up to four players simultaneously. We tested two player and four player mode and found it to be a blast and the game handled the demands of all four players without flinching. There is nothing like giving your mates the hiding they so well and truly deserve and also a lot of fun when playing on the same team. The only hint I can suggest when playing in this mode is for you to remember that your buddy is on the same team as you. It is very easy to forget they are there! For those who can't get enough footy but don't wish to play a game, simple! Just set your two chosen teams up and let the games AI battle it out whilst you and your mates watch all the action. This is a great feature and certainly a bonus for all AFL nuts. 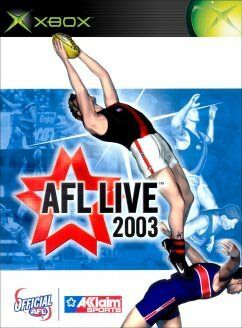 In summary, AFL Live 2003 is a game that quite simply you must own if you are a fan of sports titles or just AFL footy. The title is the slickest sports game that I have had the pleasure of playing, ever. Every detail that you can imagine has been included to make it the most immersive, realistic, fun, easy and addictive sports related time you are likely to have on the XBox for quite a long time. Add to that the fact that it's our national game and features identities that we all know and recognise also increases your enjoyment of the game. Finally, another reason to be proud of this title is that the development team, IR Gurus are based at Acclaim's Tea House building in South Melbourne. The games engine is of their own design and it is great to see such high quality locally developed product. After all this raving, I am sure that you would be amazed to know that I do not follow football yet am totally hooked on this amazing game. I recommend this title to anyone!